Molli Benson, the first in her family to go to university, is one of just nine student nurses shortlisted for the accolade, which recognises the achievements of exceptional student nurses who have shown a passion for the profession, gone the extra mile, strive to make improvements and shown the potential to be a future nursing leader. The 20-year-old from Sudbury in Suffolk, who will take up a role at Guy's and St Thomas' NHS Foundation Trust after she graduates later this year, has thrown herself in to life at Kingston University's Kingston Hill campus, becoming a course representative, an academic mentor, student ambassador and sitting in on curriculum meetings in a bid to make a difference for future generations of nurses. "I'm honoured to have been nominated for this award and to be recognised in this way," Molli said. "I've always been interested in looking after other people and making a real difference in their lives, as well as the more scientific aspects of nursing, such as sociology and psychology. Being able to bring all that together in one job is a dream." Developing herself is key for Molli who gets involved in every opportunity that comes her way. She jumped at the chance to work as a student nurse in Uganda last summer - the type of experience she encourages her fellow students to make the most of to get a more global understanding of healthcare. 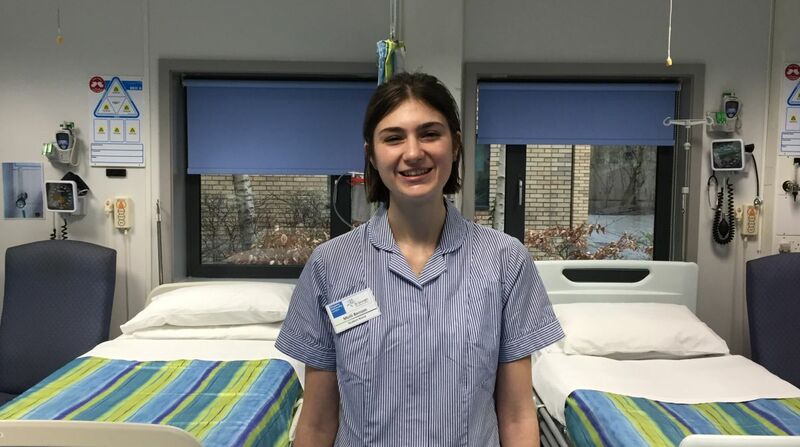 No stranger to success, Molli has also been nominated for Adult Student Nurse of the Year in the 2019 Student Nursing Times Awards. The Faculty of Health, Social Care and Education, run jointly by Kingston and St George's, has been shortlisted in seven categories overall. Molli said one of the highlights of her three years of degree studies had been putting her lecture theatre learning in to practice in the Faculty's clinical skills laboratories, which are similar to real-life hospital wards. "The facilities offer students an amazing insight for our future careers and we receive valuable feedback from the actor patients the University provides for us to train with. That hands-on experience really brings our lectures to life and arms us with so much knowledge when we go out on placements," she said. "The course has helped me develop knowledge of a well-rounded NHS and made me realise what goes on behind the scenes at a hospital. It really makes me feel like I can make a difference in the world." Associate Professor Trish Griffin attributes Molli's award shortlisting to her hard work and dedication to her studies. "Molli really is a model student. Molli has worked tirelessly throughout her three years at the School of Nursing and has made the most of every opportunity to develop herself and put the interests of her patients first," she said. The National Student Nurse Congress, founded and organised by Kingston and St George's adult nursing graduate Nikki Yun, takes place today. Keynote speakers include President of the Royal College of Nursing Professor Anne Marie Rafferty and Director of Nursing for NHS England Paul Vaughan. Find out more about studying adult nursing at Kingston University and St George's, University of London.